Last week I mentioned a recipe for a light banana cream pie, which came from a great cookbook I've been using called Secrets of a Skinny Chef . Well the pie was such as success that I reached for the book yet again for Moses' BBQ last weekend. I chose another dessert, as it seemed relatively easy to preapare and didn't require any unusual ingredients. 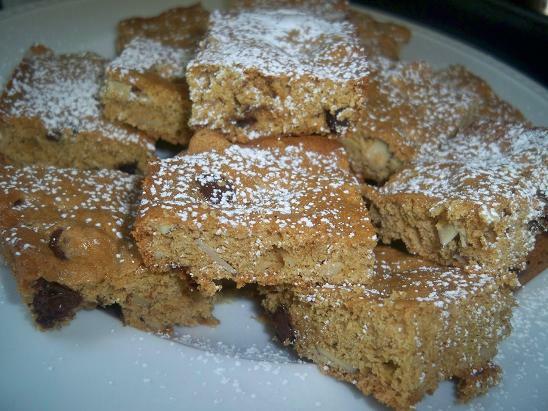 The blondies came out great! I thought they were moist enough and just like my experience with the pie, they were really light. Dan kept popping them like candy and my friends really enjoyed them too. Yay - another home run with this book! I can't wait to use it for dinner dishes. Here's the recipe - hope you enjoy it. The recipe calls for prunes to be added but I substituted them with almonds that provided nice crunch. You can use your favorite fixins too - whether that's craisins, flaked coconut, maybe even marshmallows? Preheat oven to 350 degrees. Coat a 9-inch pan with cooking spray. Sift the flour, baking powder, baking soda and salt onto a piece of waxed paper or aluminum foil. Set aside. In a large bowl, beat the oil and sugar until smooth, 1 to 2 minutes. Mix in the egg whites and vanilla. With a wooden spoon, stir in the flour mixture until just combined. Fold in the prunes, walnuts and morsels. Spread the batter in the pan. Bake 25-30 minutes or until a wooden pick inserted in the center comes out clean or with moist-looking crumbs. Cool 5 minutes in the pan, then turn out onto a wire rack to cool completely. Cut into 12 pieces and store in an airtight container for up to 5 days. You can also sprinkle the top with powdered sugar. 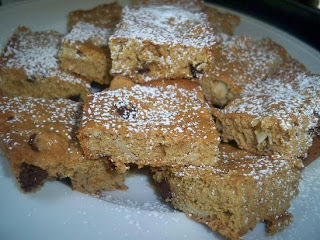 I was always under the impression that blondies had white chocolate in them? I guess that is what makes these healthy. They look quite yummy! Casey - I think what makes it a blondie is that the dough is not dark, it's light :) Enjoy!